The Acqua is made of wengé wood and supported by a chromium-plated brass console. 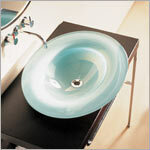 The sculpted glass wash-basin, is also sold separately, floats effortlessly on top creating dinstinct style and elegance. Acqua basin available in 12 colors. © 2004-2019. MilUSA, Inc. All Rights Reserved.